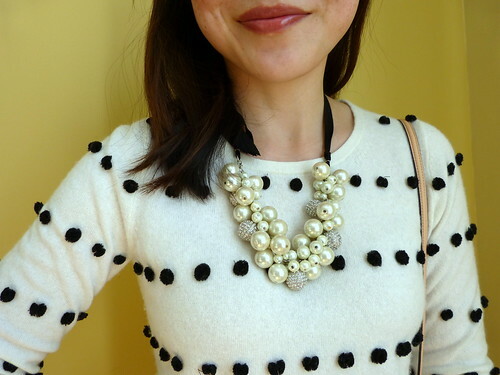 As you can probably tell from the components of most of my outfits, but I'm a big fan of J.Crew. I think the brand fits my aesthetic pretty well and I can wear many of the same pieces to the office or on a casual weekend with no problems. Plus save for some of their "quirkier" items (like this - and this guy I don't get at all), most of their clothes are in-line with the latest trends without being too trendy, so I feel that I'm getting items that don't necessarily date or age me. And let's face it, they have some awfully good sales. So of course my adoration for the brand extends to their factory stores as well. Especially when it means I get to snag some factory versions of older retail designs that I missed out on (like this entire outfit, for example). But ... when the factory store releases designs of retail items I already own - and have spent retail-level dollars on (most recently, this necklace and dress), then I get all hypocrite-y because I feel like my retail items are now less special. Why did I spend big bucks on an item that is essentially released again for cheaper just a season later? I know most of you ladies are J.Crew fans out there. What do you think when the factory stores release less expensive versions of retail items? Do you feel like it affects the brand at all? I can't chime in on this debate because even J.Crew Factory is beyond my price point. However, as an inveterate Target shopper, I know that retailer deep discounts in what seems like mere minutes after the first release (fast fashion, anyone?) and I do get deeply offended when my $34.99 sweater is now reduced to not $34.99. I don't think it makes it less special; I just want to kick myself for not waiting. Then I find comfort knowing I got my size and if I loved the item that much, it was worth full price. I think, perhaps, you can feel the same way with yours? I think the quality is better on the retail items but I agree that it is frustrating when it shows up in Factory sometimes not even 6 months later. As always, you look great! Man. I can barely afford J. Crew Factory clearance so I am the worst person to ever weigh in on this debate! That being said, I think if I save enough money to shop at a store I will get annoyed if I walk into another store the next day and it's like 50% less than what I spent! It does take away the special feeling! It's a fab warm weather necklace! While Factory sometimes releases the same designs, I find that it is not the same quality or material. They will substitute poly for silk, etc., or the cotton may be a thinner weave. Your pieces look beautiful and look like they are good, quality pieces. But, occasionally when I have bought items a couple from the Factory, I notice that yes, they are much less expensive, and yes, they are not the same quality. Absolutely - the retail version of this skirt I believe was silk and this is cotton. For me in this instance though, I prefer the cotton (I'm not lady-like enough to pull off silk without ruining it, haha). So I've taken advantage of the downgraded material sometimes! I feel like it's only in that last two years that I've "graduated" from a total Old Navy/Forever 21/Target wardrobe to adding more quality pieces from stores like J. Crew. Truth be told, I have used J. Crew Factory as my gateway to graduating to their more polished pieces. While I applaud their Factory offering for enticing people like me to step it up a notch, I feel like their factory pieces should not directly mimic their retail pieces. Maybe they could release the Factory pieces in a different color, slightly different style, etc. so it's not a direct copy. Otherwise it makes you feel like you described, much how some shoppers get upset when Forever 21 knocks off the designer stuff they saved so much to get. Ooh, if they do different colors of retail versions, that could encourage retail customers who may already that original item to buy additional in new colors ... but hey, they've got their own fancy marketing folks that know a whole lot more about my shopping habits than I do, haha. I've been in conflict about this topic. While it is annoying to see a mockoff of the retail at the factory store, I have also noticed subtle differences: usually, the quality of material is not the sam (rarely the same type or weight of wool or silk or even cotton). Also, in the case of the Charley sweater, the retail version actually has buttons on the back behind the neck, which I personally feel add much more to the sweater. So, it is annoying, the if I get retail at a sale price with the higher quality, then it does not hurt as much. In the case of the scalloped dress, factory and retail versions are both polyester so I'd be annoyed to see it cheaper, with a cuter color offering in factory. All I know is that I can only afford the factory prices, and only when they are on sale haha. So I can't really speak to this. But I will say that this outfit is amazing and so perfectly you. Love the print of this skirt. This combination is so exciting! As someone who strives to get the 'best' price on items, I'm perturbed when I find out I could've gotten any item cheaper (with some exceptions). So, I definitely understand your position. It appears that even J.Crew is approaching this issue gingerly. Factory items that copy designs from the main store often have discernible differences. The links on that factory fan fringe necklace, for example, are not as luxe as those on the one from the main store. For now, I shop both stores, but only at prices I'm willing to pay…usually sale-on-sale prices. I actually really love those sequin harem pants LOL But I also love your style--it's classic and professional. I love the mix of patterns here! The skirt is awesome! You are one of the few people that I think would be able to pull off rocking them! Lisa, so so so jealous of your pom pom sweater. I am obsessed with pom poms! I love it! And it is perfection with that skirt! i've purchased from their factory line, and they have some really cute styles and jewelry. not so much shoe quality though. Such a gorgeous skirt! I love the print so much! stuff like that doens't bother me too much, but i definitely see your point of view! That sweater is incredibly cute! I think it's fun to see items rotate through factory that I may have missed at the main store (still kicking myself on the herringbone vest though..UGH). Regardless, you look great here Lisa! What I do like with factory redos is that sometimes they tweak the shape a bit so the factory version actually fits better. Love the polka dots with the printed pencil skirt! We don't have Jcrew here so I can't really comment on that sorry! I have come to realize that I need to just wait for jewelry to be sold at the factory stores rather than buying them at retail stores. I can't pick out the difference in the quality. In clothes and shoes, there are big differences and if I like the print, I will buy the retail version because the quality is just not there for me. You already know I love this outfit and thank you for your feedback on the skirt - I decide to pass on it but did order some other items on the website today. Cool, I can't wait to see what you scored! Oh, I'd be a bit annoyed too - but at the same time, retail J.Crew has SO much better quality that factory J.Crew, I discovered that when I bought cardigans in both places and the factory cardigans just kind of lost their shape after one wear. Lovely pieces! I don't know why, but I I got a thing with print on prints outfit. You look sophisticated and classy! I love J Crew too. Sometimes the Factory items are not quite the same quality, but I find them pretty close. I believe in getting the best deal possible, so If I can get pretty decent quality, I would skip retail and just get the factory items, especially if the same retail items find their way onto the factory site. I love your mix of patterns, color and texture. Nice look. I'm a big fan of J. Crew and JC Factory, so I don't think it diminishes the brand at all. LOVE that skirt, btw. I've only ever owned two pieces from J.Crew, one a sweater I founf at Goodwill ($3.99) and the factory version of the crystal pave link bracelet. However, you'd be amazed at how much J.Crew you will find at the average thrift store! Especially since you are so petite, you'd fit everything. There's nothing better than my $4 cashmere J.Crew cardigan! Ooh, $4 cashmere, that's awesome! So cute! I am such a J. Crew girl too. Although I really don't buy much from Factory. I don't know why. We just got a J. Crew Factory near us and I can't wait to check it out! You'll get hooked by the great deals at the factory - though with this recent 40% off sale at retail, most people hadn't needed to go to factory for price! Lisa, you personify why this talented driven label is so successful . They mix patterns and color like no other company, and then make jewelery that compliments it all. You choose these pieces perfectly for you body, and you'll ways look inspiring . I always wondered about that...I only shop at j crew factory and never at j crew bc I think their prices are too high. But I also see a lot of similar things in the factory, and I just bought two cardigans from the factory that are also in the stores right now!!! They aren't even on sale in the store...so I do wonder how that strategy works out for them. Cute outfit BTW...I saw that skirt and wondered what the heck I would were with it, but the polka dots are perfect. Factory has some awesome sales too! adorable pattern mixing going on here! just adorable! When I think of J.Crew, I think of you actually. I've never shopped there myself, mostly because I'm sure I'm sized out and also because it's a little more polished where I'm a little more playful. Also, I don't think I have the eye for pairing their preppy pieces to the same fun effect you're able to. I really should pop into one of their stores, though, just to see. I can follow one of your fashion recipes. Pair a classic black and white printed piece with pops of bold color and a bejeweled statement necklace. Looks preppy-chic instantly! When it comes to the factory store thing - I definitely get frustrated when I see jeans or a dress the next season priced at half what I paid for them. If it "sold out" in my size, how can it be at the outlet several months later in full size runs? I feel like factory outlets make the clothes more accessible to shoppers who don't want to pay full retail prices and are willing to sacrifice being a little late on trends. But I've also noticed that factory outlets are stocked more with classic, basic pieces than trendy pieces, so why not just price them lower from the get-go if they're going to stay in style but you're going to mark them down anyways? Oh yes, because I'll pay for them. I love the pom pom sweater with the printed skirt! So cute! I don't have a problem with factory stores because 1) I can't afford J.Crew unless their items go on 40% off clearance, 2) I feel like the similar styles don't come to the factory store until 6months to a year later. So if you really, really like an item you should be willing to pay full price for it, right? Plus, not all J.Crew items end up at the Factory store. and 3) the quality in the factory stores isn't the same so you get what you pay for I guess. love this outfit!! fabulous print mixing! I love the brand, but i have nothing from them. I always admire your well fitted looks, and when i read below to see the brand, most of the time it's JCrew.